With a stay at Tiki Hotel Surfers Paradise in Surfers Paradise, you'll be on the Strip and minutes from Cavill Avenue and Chevron Renaissance. This apartment is close to SkyPoint Observation Deck and Surfers Paradise Beach. Make yourself at home in one of the 70 air-conditioned rooms featuring kitchens with refrigerators and stovetops. Wireless Internet access (surcharge) keeps you connected, and cable programming is available for your entertainment. Conveniences include microwaves and ceiling fans, and housekeeping is provided daily. Take advantage of recreational opportunities offered, including an outdoor pool, a waterslide, and a spa tub. This apartment also features wireless Internet access (surcharge), tour/ticket assistance, and barbecue grills. In addition to an outdoor pool, Tiki Hotel Surfers Paradise provides a waterslide, a spa tub, and a sauna. Wireless Internet access is available for a surcharge. A poolside bar is on site where guests can unwind with a drink. 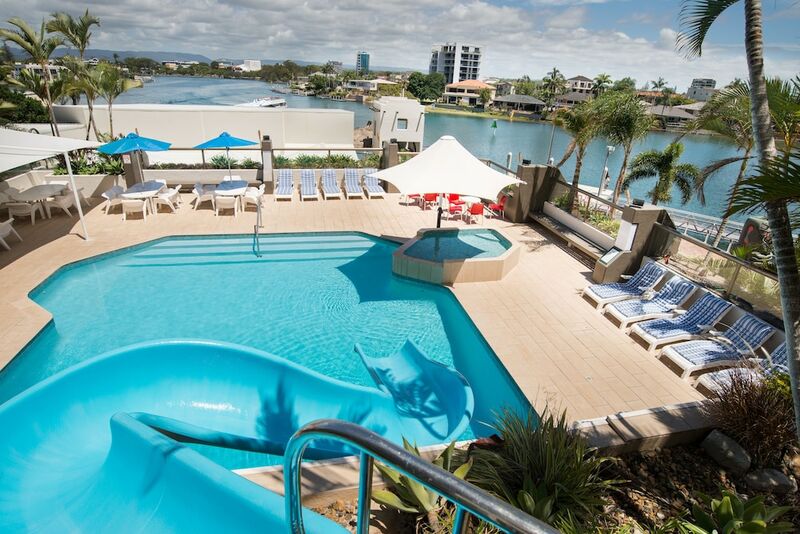 This Surfers Paradise apartment also offers tour/ticket assistance, barbecue grills, and a garden. Limited onsite parking is available on a first-come, first-served basis (surcharge). Tiki Hotel Surfers Paradise is a smoke-free property. An outdoor pool and a spa tub are on site. Other recreational amenities include a waterslide and a sauna. The front desk hours vary at this property. To make arrangements for check-in please contact the property ahead of time using the information on the booking confirmation. Reception hours are 9.00 AM-5.00 PM on Sundays. For more details, please contact the office using the information on the reservation confirmation received after booking.